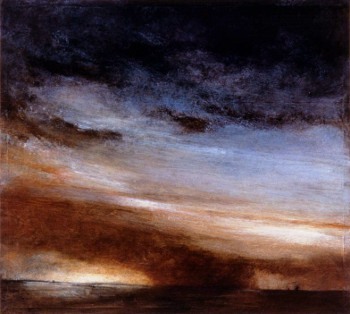 Ruby Wind is part of a series of paintings which focused on weather and the land. I painted clouds, dust, smoke, storms and clearings in enormous expanses of sky over flat land and water. Using weather imagery allowed me to explore a wide range of conflicting emotions and meanings to describe worlds of impending dangers, harsh beauty and safe havens. I was not interested in describing a particular placer or time but rather in creating a world where fiction can portray truth. I searched for the heart of my paintings through forming and reforming images, accepting the accidents of painting that can happen along the way much as weather can disrupt and change the land and sky. I used imagery drawn from art history, the newspaper, weather books, my surrounding and my memories.